My research group focuses on three basic questions related to hearing loss and aging. Many of these questions were discussed recently at an Institute of Medicine workshop on hearing loss and healthy aging that I helped co-chair in January 2014. These presentations can be viewed online here. 1. What are the consequences of hearing loss for older adults? The basis of this research starts with the concept of what characterizes healthy aging—namely maintaining optimal cognitive and physical functioning as we age. Intuitively, many people would assume that hearing loss is only related to our cognitive and physical abilities because of some shared pathologic process. For example, as your body ages you’re more likely to lose your hearing and have poorer memory, or if you smoke or have diabetes, you’re also more likely to have hearing loss and have poorer cognitive abilities. But, if only a shared pathologic process links hearing loss with these broader outcomes then this relationship isn't very interesting because it means that treating hearing loss wouldn't have an impact on these other outcomes. We’re beginning to understand now, though, that there are likely mechanistic pathways through which hearing loss contributes to accelerated declines in the cognitive and physical functioning of older adults. Much of our research over the last few years has focused on investigating whether hearing loss is independently associated with cognition and dementia. We have collaborated with other aging researchers and have analyzed observational epidemiologic data from the Baltimore Longitudinal Study of Aging, the Health, Aging, and Body Composition Study (HealthABC), and the National Health and Nutritional Examination Surveys (NHANES). Through these studies, we have shown that hearing loss is independently associated with poorer cognitive functioning on non-verbal tests of memory and executive function, accelerated cognitive decline, the risk of developing dementia, and accelerated rates of brain atrophy. Currently, we're also beginning to study how hearing loss is associated with declines in physical functioning, frailty, health care utilization, and occupational status. 2. How can hearing loss be most effectively addressed in the community? Collaboration with start-up companies (e.g. Conversion Sound) actively looking to develop novel, audiologically-sound approaches toward self-fit, low cost, and easily accessible hearing devices. 3. What is the impact of treating hearing loss on older adults? The question of whether treating hearing loss could potentially delay declines in cognitive and physical functioning remains completely unknown. We are currently conducting an ongoing prospective observational study of adults who get hearing aids or cochlear implants at Johns Hopkins. In this study, the Studying Multiple Outcomes after Aural Rehabilitative Treatment (SMART) study, we are measuring the neurocognitive, social, and physical functioning of patients before and after hearing loss treatment. Most recently, in collaboration with Mark Laudenslager’s lab at the University of Colorado, we are also beginning to measure salivary and hair cortisol as biomarkers of stress and inflammation before and after hearing loss treatment. 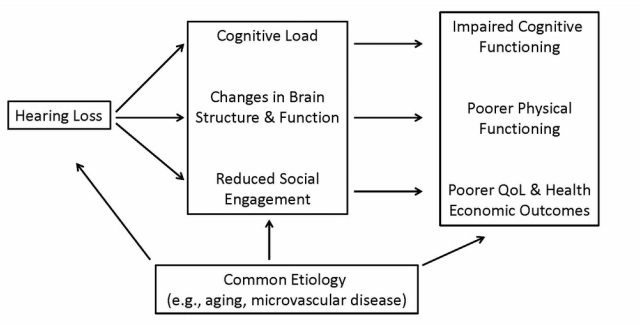 Finally, working with cognitive aging and audiology colleagues at Johns Hopkins, the University of South Florida, and with investigators in the Atherosclerosis Risk in Communities - Neurocognitive Study (ARIC-NCS), we are also now planning a definitive randomized controlled trial of whether comprehensive hearing loss treatment in older adults can reduce the risk of cognitive decline and dementia. Click here to view videos from a recent Institute of Medicine workshop on hearing loss and healthy aging where these questions were discussed.